24. 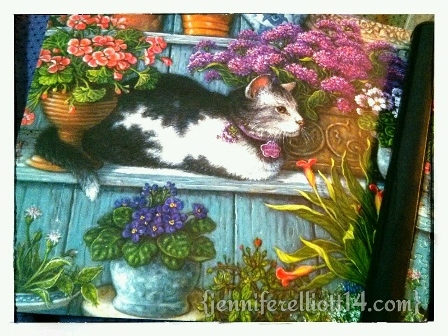 Complete and frame a 500-piece puzzle. I love Van Gogh! I wonder where I can find the Starry Night puzzle. I really didn’t want to spend $20 on a puzzle, but special features tempted me too much. Portability. A frame. Two drawers with dividers. A cat. Flowers. Five really good reasons to buy a $20 puzzle. Maybe I should’ve bought the Cinderella puzzle when I had the chance — $9.99 for a 750-piece puzzle doesn’t sound so bad now. LOOK AT THE AWESOME DIVIDERS! Have you seen the tiny little puzzle pieces? Did I really want to work with tiny pieces? Not really, but for some reason, I really wanted to buy it. Even Charlie tried to talk me out of buying the puzzle, saying I could find a better puzzle for less money. Of course, he was right. 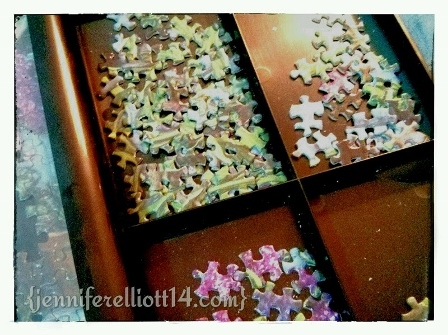 A puzzle for less than $20 and with bigger pieces. DAY 1: PIECING THE FRAME. 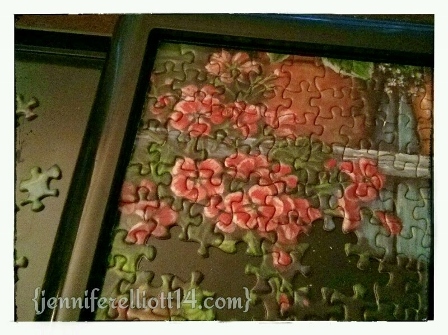 If you look closely at the above picture, you might be able to see the clear plastic divider inserted between the puzzle pieces and the frame. 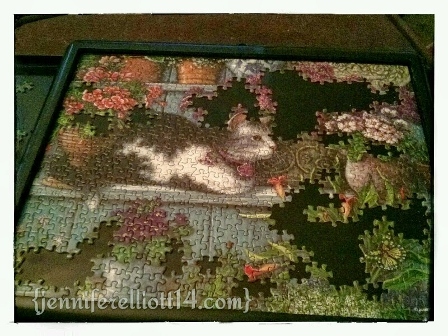 I love the idea of storing and keeping a puzzle safe instead of leaving it out in the open and creating a barrier to protect the pieces from my cats. And I take the puzzle with me anywhere. 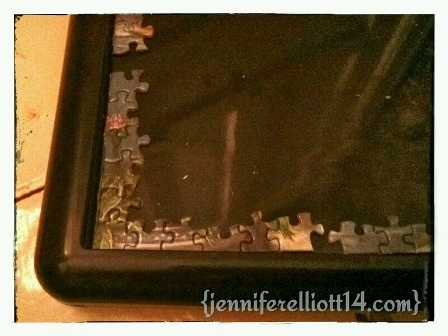 LOOK AT MY AMAZING PROGRESS IN THE PUZZLE’S FRAME! 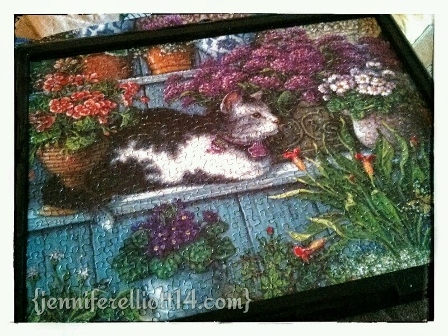 I just needed about a month to finish the puzzle, with some help from Charlie, Tova (my niece), and Ethan (my nephew). Charlie discovered super slim dividers hidden underneath the frame and found more pieces. Whew! I was worried about losing the tiny pieces anytime I worked on it. MY NIECE, TOVA, DID A FANTASTIC JOB PIECING THE PINK FLOWERS. 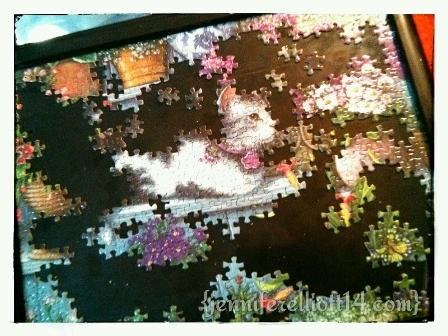 I was pleasantly surprised when I realized how much I enjoyed working on the puzzle despite the super tiny pieces. 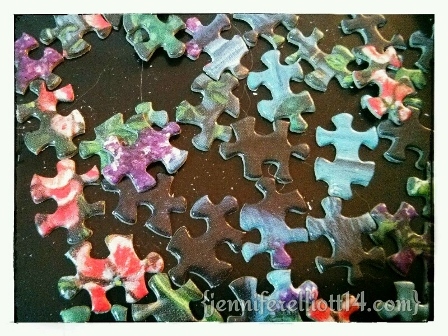 Even when I couldn’t work on the puzzle for long, I loved the accomplish feeling when finding a matching piece. Hmmmmm. Maybe I should consider working on a bigger puzzle. LEAVING THE PURPLES FLOWERS — PROBABLY THE HARDEST PART — FOR LAST. DONE! FINISHED! COMPLETE! WOOT! I’M SO STINKIN’ PROUD OF MYSELF.